Broom Tree’s free spiritual retreats allow pastors and their spouses to share in Elijah’s broom tree experience. Guests are invited to trade the busyness and intensity of pastoral leadership for physical and spiritual rest and rejuvenation. At Broom Tree retreats it is possible for pastors to find alone time with God. Our retreats are designed with both married and single pastors in mind. Located just 1 hour north of Grand Rapids, Michigan, the Shack is a 100-acre country estate complete with log lodges and lake. Plenty of walking trails and places to enjoy the beauty of God’s creation. The property abounds with gazebos and benches for times of reflection and prayer. There’s even a small prayer house on the lakeside trail. 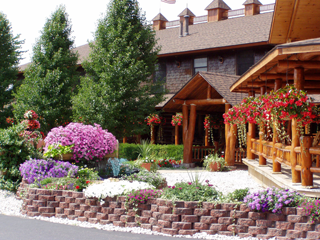 The Shack Country Inn has something special to offer each season. Winter makes the in-room fireplaces and hot tubs very inviting, during springtime, see maple syrup being prepared from gallons and gallons of sap. Summer brings the awesome display of “Flowers at the Shack” and fall is the time to enjoy the crisp air and the brightly colored maple leaves. Each room is appointed with a two-person hot tub, fireplace, fridge, coffee maker, private bath, king or queen bed, log rockers, and study table. It’s the perfect home away from home! THE GOAL The purpose or goal of the retreat is to provide time and space for Pastors and their spouses to intentionally spend time alone with Jesus. Since adults learn most beneficially through experience, the week provides guides with just enough direction to be helpful. THE WEEK is limited to 12 couples or 18 couples (all from different churches). In addition to a renewed awareness of God’s presence and call for them as believers, it will give pastor couples time for soul care, prayer and study. THE COST for this week is paid for by donations from individuals, churches, foundations and several fund raising events that Broom Tree Ministries offers. This is a free gift to the pastor couple and includes all food, lodging and program materials. HOW TO SIGN UP Pastors are asked to sign up on this website. If their church would like to contribute to the provision for this retreat, payments can be made on the DONATE page or mailed into Broom Tree Ministries. THE GOAL The purpose or goal of the retreat is to provide time and space for lay leaders in the church to intentionally spend time alone with Jesus. Since adults learn most beneficially through experience, the weekend provides guides with just enough direction to be helpful. THE WEEKENDS are limited to 12 couples (all from different churches). In addition to a renewed awareness of God’s presence and call for them as believers, it will give these leaders information that they can take back to share with their churches. THE COST for these weekends is $675 per couple, which includes all food, lodging, and program materials. HOW TO SIGN UP Pastors are asked to recommend that these leaders come. The church can pay for their weekend or they can pay for it themselves on this website. Payments can be made on the DONATE page or mailed into Broom Tree Ministries. View 2019 Retreat DatesRequest Invitation!